Very recently I tried the Walmart Free Grocery Pickup for the first time and I am hooked! It was so easy, convenient, and oh yeah – FREE! 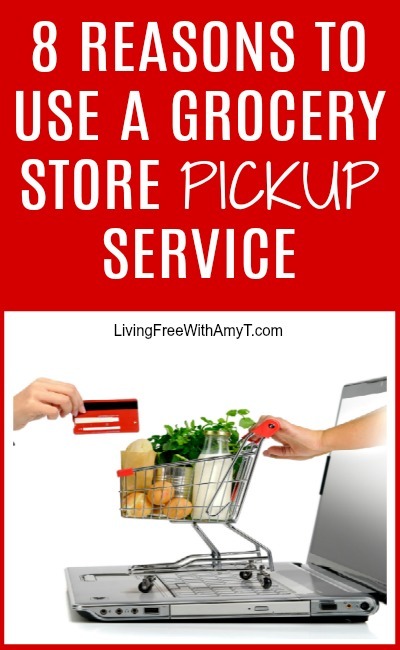 It quickly made me realize just how many benefits there are to using a grocery pickup service, something I never really took advantage of before. I’m not sure why I waited so long to use it! Please note that in no way is Walmart paying for or sponsoring this post. All of these opinions are strictly my own. When shopping at a grocery store, it is inevitable that you are going to walk up and down many aisles and have thousands of different products catch your eye. This in turn almost always leads to buying items not on your shopping list. When that happens, you tend to spend more than you had planned on. When shopping online, you can search for the items you need right off your grocery list and not see so many other things you had no intention of buying. This helps you not venture off your list. You can also eliminate those times when you are at the store and aren’t sure if you have something at home and end up buying double because of it. Instead, you can easily walk to your kitchen or pantry and see what you already have on hand. Because you will be spending less money, you will have a much better chance of sticking to your budget. I know there have been plenty of times I left the grocery store having purchased so many things that were not on my shopping list that I ended up overspending my budget. Using the grocery pickup allows me to buy only what is on my shopping list. If you are currently budgeting, how often do you stick to your grocery budget? If you often go over it, consider how grocery pickup will help you to better stay under. This is one of my favorite reasons I use grocery pickup. I feel like I have so much to do in a day that freeing up an hour where I don’t have to grocery shop makes me so happy! Sure, I have to spend some time searching and ordering online, but it does not take nearly as long as actually going to the store and I can do it from the comfort of my own home. There are many reasons it can be challenging to bring kids grocery shopping. One obvious reason is that kids can get pretty crabby at the store, as grocery shopping is probably not something that they necessarily enjoy. Another reason is that they often want so many things! If you have kids, how many times have you left the grocery store having paid for candy, toys, or other gadgets you did not anticipate? You can eliminate that by shopping online, thus saving you money. Even younger children can make shopping challenging. I currently have a newborn and although I could bring him in for an hour-long grocery trip, I would rather not. He needs to eat often and I wouldn’t want to have to cut my grocery trip short if he gets fussy. With the grocery pickup, I never even have to take him out of the car! Some people love to grocery shop. It’s a way for them to get out of the house and they enjoy being out around so many people. I for one do not care very much for it. The crowded aisles often get to me and I really hate it when I forget something on one end of the store and have to go all the way back to get it (does that make me sound lazy??). Grocery pickup can help with planning of meals because you’re not walking into a store without a plan and feeling overloaded with all the options. When shopping online, you can research recipes and put meals together before you even start placing the items in your cart. You can also take a look in your fridge and plan meals around what you already have. Even more, when shopping at the grocery, they may be out of something you were planning a meal around and then you have to improvise when you’re there, which can lead to frustration and overspending. But when you’re home shopping, you can easily start your plan over. If you live in a wintry climate like I do, grocery pickup can be such a great thing. I love that I can pull right up to the door and have my car loaded for me and I don’t have to walk across the parking lot in the freezing cold – especially now that I have my newborn. And not having to load the groceries in my car and take the shopping cart to the corral – bonus! If you entertain for the holidays, you know how stressful that can be. You can give yourself one less thing to worry about by buying all of your holiday food online. Then you have more time to get your house ready for company. It’s FREE! I used Woodmans grocery pickup in the past, which had a fee. There’s only a $30 minimum. Woodmans at the time had a $50 minimum. They will substitute any items they are out of and if you don’t want the substitution, they will take it back and not charge you for it. They showed me my produce to make sure I was happy with what they picked out. I was able to check in on my phone when I was on my way so they knew when I would be arriving. They were already walking out with my groceries as soon as I pulled up!